Tickets available for purchase to all events in the festival here! 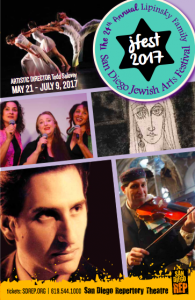 The 24th annual Lipinsky San Diego Jewish Arts Festival includes a slate of twelve performance in theater, dance, music, film, and fine arts at four different San Diego and North County venues. This year’s festival features a more broad celebration of San Diego’s diverse performing arts community. Highlighting the festival will be: a sneak peek at a Hershey Felder work in progress, “The Stories of Sholem Aleichem;” a celebration of Andrew Viterbi’s new memoir, “Andrew Viterbi: Reflections of an Educator, Researcher and Entrepreneur” (directed by Ali Viterbi); “Minor Fall, Major Lift,” a brand new evening of dance from Malashock Dance; and The 8th Annual “Woman of Valor” (co-written and directed by Ali Viterbi). Ali is proud to announce that she will begin pursuing her MFA in Playwriting at UC San Diego next fall . Over the next three years, Ali will study with chair Naomi Iizuka, Deborah Stein, and Allan Havis, among others. Each spring you can see full productions of her new plays at the Wagner New Play Festival at UCSD/La Jolla Playhouse. Ali is so excited to attend her dream school, commune with a talented and diverse group of playwrights, and return to her hometown of San Diego. California, here I come! You may reserve your tickets here! This full-length, non-linear, two-actor play chronicles Sadie and Ethan’s twenty-year relationship as they tour with the Grateful Dead across the country. As Sadie and Ethan travel from concert to concert, the audience follows the triumphs and travails of their relationship—from collegiate concerns to marital challenges. Each scene is set in a different year and different motel room, as Sadie and Ethan, played by the same actors, fall in and out of love with the Dead, as well as with each other. The play investigates how healthy relationships become abusive, and why people remain committed to each other over time. Played to the music of the Grateful Dead, DEADHEADS asks “Where does the time go” when you think you’re in love. Please join me for the second public staged reading of my newest play, THE THAY BAY PLAY, at the Loft at Davenport Theatre (354 West 45th Street, New York, NY). There will be a small reception following the reading. Even while critiquing the highly traditional and inimitably American rituals of sorority life, The Thay Bay Play embraces the redemptive power of female friendships. At its core sits Joni’s burgeoning friendship with Kate, her cynical and struggling sorority ‘Big Sister’, who has long since given up on fitting in. Supported by an all-female “Greek Chorus”, Joni and Kate strive to please those around them while retaining personal autonomy; an all-too-familiar task for American women today. When an allegation of sexual assault shatters the sorority’s status quo, Kate and Joni must both decide who they are, what they want, and whether their blood really does run aquamarine-and-ivory. A stylized, surreal, and theatrical work, The Thay Bay Play mixes pop culture with pageantry, superficial with sacred, to create a searing portrait of life as a young, 21st century woman. Cakes & Ale is the best way to find New York’s undiscovered theater talent through intimate readings in people’s homes. Kick back, relax, and enjoy cupcakes, ale, and a reading of Ali Viterbi’s new play Deadheads. Seats are free but extremely limited.